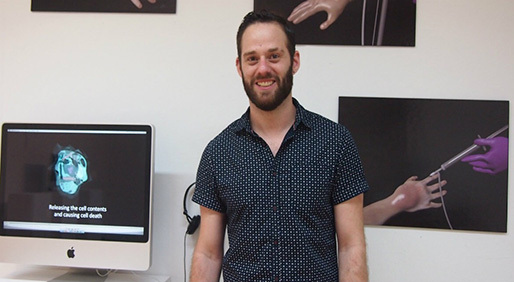 Driven by personal experience and his love for art, Ryan Berardi created a 3D animation that would help health care professionals if they wrongly administer chemotherapy to patients. Artist Ryan Berardi’s work goes way beyond pretty pictures. In fact, his 3D animations of what can go wrong during chemotherapy paint a horrific scene. Berardi got firsthand experience with chemo after being diagnosed with acute lymphoblastic leukemia (ALL) at 17. He then combined his experience of cancer with his artistic talents to create a 3D animation that helps oncology nurses avoid giving patients the wrong chemo medications. If they make a mistake, the tool can help nurses see where they went wrong to prevent future mistakes. “This study of anatomy, alongside my cancer treatment for leukemia led me to develop a love for medicine and the human body,” Berardi said in an interview with CURE. Berardi, now 25 years old, graduated from the University of the Arts in Philadelphia with a degree in sculpting, before moving on to the University of Dundee in Scotland, where he is working toward an MSc in Medical Art. Together with Dr. Fiona Hogg, a plastic surgeon consultant at Ninewells Hospital, NHS Tayside, he worked on the project. 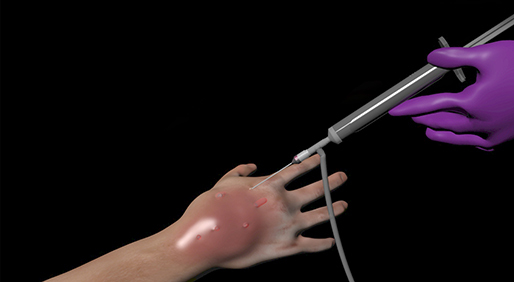 The animation shows an image of the patient’s hand during the infusion, and illustrates what is called an “extravasation.” That happens when the chemotherapy leaks out of a vein and into the surrounding tissue. The animations also and goes over the symptoms and side effects. The animation also walks the health care provider through the stages of the “Flush-Out” technique, which is used to prevent tissue necrosis, or death. “My hopes for the animation, along with Dr. Fiona Hogg, were to teach medical personnel the Flush-Out Technique in a simple and effective way,” Berardi said. “Although it was originally intended to be purely for medical professionals, I have shown it to people who have no medical background and they have commented how educational the animation is. Berardi was diagnosed with ALL at the beginning of his senior year of high school and underwent six months of intensive chemotherapy, during which he received IV injections, spinal taps and bone marrow tests up to five days a week. Then, he had to continue injections – though far less frequently – for three years. By the time he was a freshman at the University of the Arts, his health care team decided that there was too high a risk for infection if he kept his chemotherapy port in. So, his port was removed and he had to receive vincristine (a chemotherapy agent) via an injection in his hands – which posed a serious risk for extravasation. “I never fully understood the severity of the injection, and the potential tissue damage that could result if an extravasation occurred,” Berardi said, remembering that whenever he received an injection, he always had two nurses, plus his mother, who was also an oncology nurse, in the room. “The making of the animation allowed me to work with medical professionals teaching me the severity of chemotherapy injections and extravasation, while allowing me to produce artwork that could potentially save a patient from reconstructive surgery, or even amputation,” he said. In the meantime, Barardi accepted an internship with the University of Dundee where he will be the medical artist for a cancer progression video game used for public education. In the long-term he hopes to continue down this career path, working with medical professionals to help create educational tools.